Wasps, sometimes referred to as hornets, have a sting that's painful enough to ward off most predators. Combined with bright black and yellow coloring that's designed to ward off attacks, wasps don't have to worry much about becoming prey. This doesn't mean, however, that there aren't a number of animals willing to eat these stinging insects. 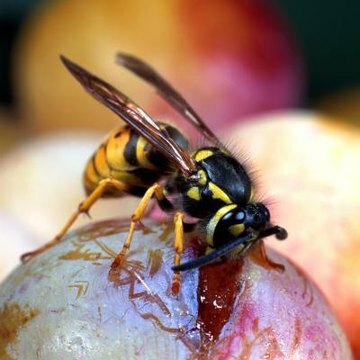 Although wasps feed on insects, and are sometimes purposely introduced by farmers to protect crops as a natural form of pest control, they are also prey for certain bugs. These include the praying mantis, robber flies, dragonflies, centipedes, hover flies, beetles and moths. Large wasps will even prey on smaller ones. For example, paper wasps will often kill young wasps. Although they are actually arachnids and not insects, spiders will also capture wasps and eat them. Predatory reptiles and amphibians don't seem to care that a wasp is capable of stinging. They simply see another meal on the long list of insects they're willing to eat. Frogs, lizards, toads, salamanders and sometimes even turtles will make a meal out of a wasp. These predators don't seek out wasps as their main source of food, but rather are opportunistic and will eat one if given the chance. Birds who regularly consume bugs will eat wasps. Some will even purposely hunt down wasps, such as starlings, blackbirds and magpies. Other birds that make wasps an occasional snack include sparrows, wrens, orioles, bluebirds, woodpeckers, warblers and common nighthawks. These birds are wise enough to limit their hunt to solitary wasps, and avoid disturbing them near the wasp nest. From small mice to large bears, other creatures that eat wasps are mainly interested in the larvae rather than the adults. The exception is bats, who will eat flying adults. Mice and rats, skunks, raccoons, weasels, badgers and wolverines are all brave enough to occasionally attack a wasp nest in order to eat the larvae inside. Humans have even been known to eat wasp larvae in certain parts of the world. What Is the Relationship Between Wasps & Caterpillars?